Phineas or Pinchas is the name of this week’s Torah portion. You might recognize it as the Hebrew name of your father, grandfather or great-grandfather. I recall long ago men who went by the name, Pinky. I used to think that Pinky was an unusual name until I became familiar with his namesake in Torah. Pinchas is a Biblical personality who was known for his remarkable passion to serve God. In Numbers 25, we learn how Pinchas drove a spear through the bellies of an Israelite man and a Midianite woman who violated God’s covenant. For his zealotry, Pinchas was granted God’s “pact of friendship” or “Brit Shalom”. In addition, Pinchas and his descendants enjoyed a pact of priesthood for all time. In general, zealotry in Judaism is not prized. As biblical events often do, this one inspires us to value Pinchas’ role in securing the faithfulness of the Israelite people against false gods and idol worship. But, zealotry is reserved for biblical stories and extraordinary circumstances. How do we know? The word that describes Pinchas’ passion here is the same word used to describe God’s passion in Exodus 20. In the Ten Commandments, God is called “an impassioned God (a jealous God)”, “El kanah”. Here Pinchas “took impassioned action for God”, “Kinei l’Eilohav”. K-N-H is the Hebrew root that means impassioned. Pinchas acted on a level we can only find in the Bible. Furthermore, it is passion that should only be found in the Bible. Unfortunately, we observe zealotry in the world in the hands of modern fanatics often acting in Biblical or medieval ways. For example, IS or ISIS is passionate and frightfully dangerous. It preserves one small brand of Islam and aims to annihilate all the rest. Every religion has had fanatics including Christian crusaders of the past. But, Judaism has them, too. Orthodoxy in Israel preserves their passionate view of Jews and Judaism by delegitimizing non-orthodox Jews, with a particular focus on destroying Reform Judaism. This past week, Orthodox minister of religious services, David Azoulay of the Shas party in Israel, said that he did not consider Reform Jews to be Jewish. Prime Minister Netanyahu objected to Azoulay’s remarks but didn’t go far enough and remove him from his national position. Notwithstanding the hope for world peace, we would do well to begin with hope for peace between Jews, by acting as one Jewish people even when we interpret God and Torah, differently. These are not biblical times, yet Pinchas is still relevant. He still teaches us a lesson about our passion to preserve the Jewish people. Look around. In every community, by an extraordinary majority, only Jews support Jews. I am not discounting the role of CUFI, for those who know what it is, but by and large, the Jewish future still depends on Jewish passion. We, alone, maintain our Jewish institutions and way of life. Who else but Jewish families support Seven Acres Home for the Jewish Aged? 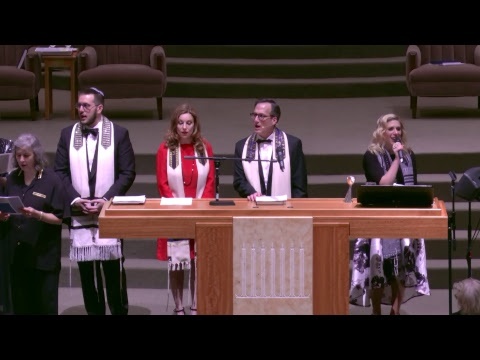 Who else but Jewish families make annual pledges to Houston Jewish Federation to sustain the well-being of Judaism here, nationally and overseas? Who else but Jewish families maintain our magnificent synagogues and preserve the legacy of a congregation like Beth Israel, organized in 1854? Who else but Jewish parents and those who are raising Jewish children insist on a quality Jewish education through real study and participation? Tell me that all of this doesn’t take passion. It absolutely takes passion. We should all be moved by our duty to serve the Jewish community, here and in Israel. Pinchas was biblically passionate. How else was he going to make a point in Torah? You and I can be passionate, too. It would do us well. Consider the role that you can play and the contributions you can make. Let’s be sure that in our world of many peoples and ideas, there will always be a place for Jews and Judaism, and a “Brit Shalom”, a pact of friendship, for all time. Congregation Beth Israel’s Trip to Israel will take place May 29-June 7, 2016. Go to www.beth-israel.org, to sign up now!